Z390 plugs the glaring holes in Z370. 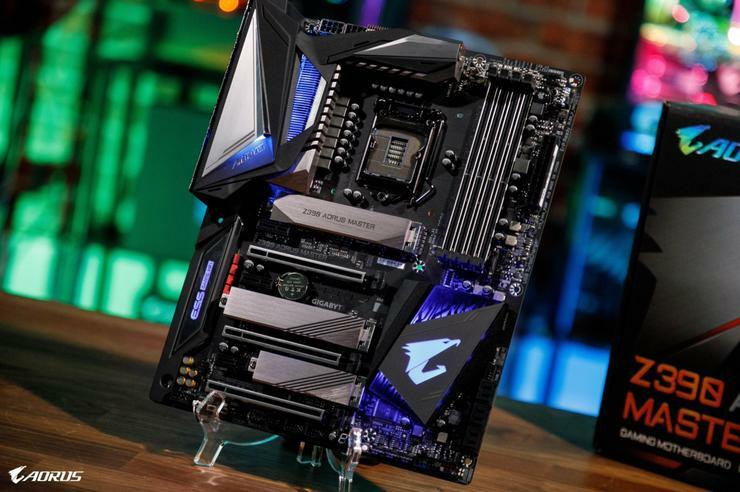 A new chip demands a new motherboard chipset, and this week, Intel and its partners revealed a wide array of Z390 motherboards to accompany the new 9th-gen Core processors. Z390 builds atop the foundation set by existing Z370 boards, but its capabilities come as no surprise, as Intel published documentation detailing the high-end chipset all the way back in May. Nevertheless, Z390’s arrival gives Intel a new flagship motherboard lineup and should finally bring the bizarre, drawn-out saga of Intel 300-series motherboards to a cohesive close. Last year, Intel’s 8th-gen “Coffee Lake” processors launched in October 2017 with only enthusiast-class Z370 motherboards in tow. In April, Intel finally released the full lineup of 300-series motherboards, but surprisingly, the cheaper H370, B360, and H310 chipsets included premium features that Z370 lacked. They integrated support for speedy 10Gbps USB 3.1 Gen.2 ports into the chipset, and also moved a lot of the functions needed for wireless networking into the platform controller hub itself with Intel’s CNVi wireless-AC technology. The new Z390 chipset launching alongside the Core i9-9900K, Core i7-9700K, and Core i5-9600K weaves those swanky extras atop Z370’s already formidable capabilities. Specifically, Z390 boards will include up to six USB 3.1 Gen. 2 ports (compared to four in the lesser-priced chipsets). Z390 motherboards can also include integrated 802.11ac wireless capabilities if the motherboard manufacturer chooses to do so. Z390 motherboards also include integrated SDXC (SDA 3.0) support and a newer Intel Management Engine (IME) firmware version. 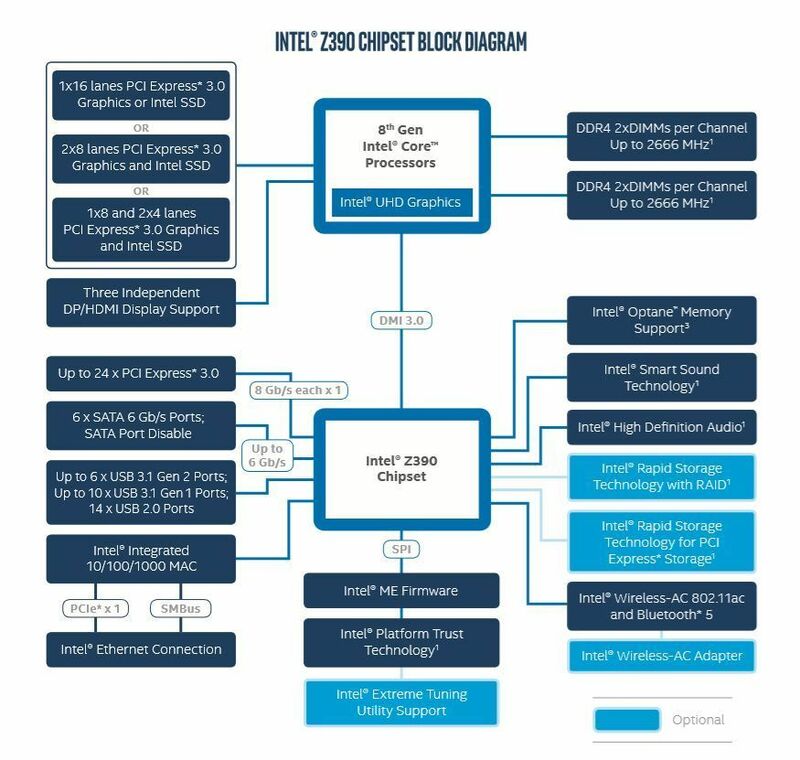 An Intel block diagram of the Z390 chipset (click to enlarge). Beyond that, Z390’s specifications mirror Z370’s, including support for CPU overclocking with compatible K-series chips, RAID setups, and Optane Memory. Yes, it’s mostly an incremental update. Intel’s 8th-gen and 9th-gen processors will run on both Z390 and Z370 motherboards, though you’ll need to apply a BIOS update to run a 9th-gen part on Z370. If you’ve already invested in a Z370, it’s probably not worthwhile to upgrade to Z390 unless you need those USB 3.1 Gen. 2 ports. If you’re building a new system from scratch, however, Z390 is clearly the better option. 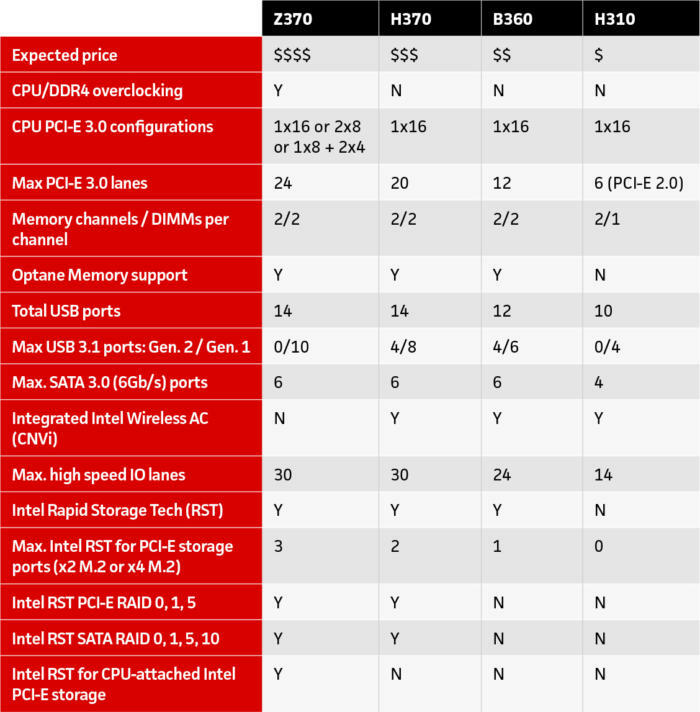 This chart from our comprehensive guide to Intel 8th-gen motherboards shows what you get from the existing Z370, H370, B360, and H310 chipsets. Z390’s underlying specs match Z370’s except for the handful of new features mentioned above. While Intel’s 9th-gen Core chips aren’t launching until October 19, you can already buy more than 50 motherboards with the Z390 chipsetRemove non-product link at Newegg from all the usual suspects, though EVGA’s Z390 motherboards are still listed as “coming soon.” The cheapest one available is the Gigabyte Z390 UD for $130Remove non-product link, while at the high end you find fully loaded flagship options like the $350 Asus ROG Maximums XI CodeRemove non-product link, the $300 ASRock Taichi UltimateRemove non-product link, the $290 Gigabyte Z390 Aorus MasterRemove non-product link (pictured at top), and the ridonkulously over-the-top $600 MSI MEG Z390 GodlikeRemove non-product link, which comes with an M.2 expansion card and a video capture card to let you record your most glorious gaming moments. You’ll mind Z390 motherboards with various capabilities and features at price points between those extremes over at NeweggRemove non-product link. Editor’s note: This article originally published in May 2018 when Intel published Z390 documentation. It was revised extensively after the official Z390 reveal in October.